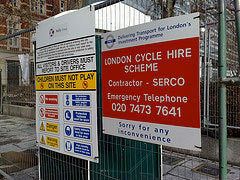 London's cycle hire scheme is due to get rolling this summer. We know about the blue bike's ears and how your ride will be priced. We even had an inkling of where we'd be able to pick up our Borocycle. Now someone's taken us at our word and trumped TfL by independently creating their own map of the planning permission approved docking stations. The map provides an exciting smattering of blue dots covering Camden to Kennington, Kensington to Whitechapel and all the bits in between, giving us hope that the £1 short hops will be a reality. It also tells you the capacity of the docking stations. Naturally, they're beavering away on an iPhone App to help the technically tooled up cycle hirer locate their nearest ride. Which is all well and good, as long as there are wheels available for you, when you get there. Perhaps TfL will bear this in mind, when they finally catch up. You can follow the App's progress @cyclehireapp.